The gods battled for thousands of years before they established balance in Lemuria; the children of the blessing are about to upset that balance. When key events prophesied thousands of years ago finally take place, those who lust for power will do anything they must to take control—even if that means killing the children of the blessing. The children of the blessing have never met. Renn wants to be a farmer and Avaris a warrior, but their birth and blessing set an ancient prophecy in motion that promises to shift the balance of power on the continent of Lemuria. The two boy’s dreams and innocence are shattered by those determined to influence the events to come and seize power for themselves. When loved ones are killed and homes destroyed both boys must flee from horrifying creatures and powerful magic users. Renn has to cross the continent to reach the safety of Elder Island where he can receive training from the Lore Masters; Avaris decides to follow the evil creatures that have ruined his life to caves beneath the Cragg Mountains where the surviving members of his tribe have been forced into slave labor. The Grand Warlock, Kahn Devin, has determined that both boys will either join with him or die. I have always been a writer–both of music and stories. But I made the decision to become an epic fantasy author when I was in my twenties and a brother-in-law told me he was going to write a fantasy book. That statement from him lit a fire in my mind and I said: "That's a great idea, I'm going to do it too." It took a lot of planning, writing, re-writing, reading, editing, more writing, rejection, etc… before I finally got to the point where I felt I was ready to publish my story to the world. Of course, epic fantasy is usually big books and several of them in a series. My epic series is no exception to this. 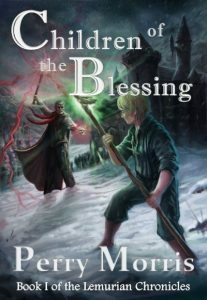 Children of the Blessing is the first book in my epic fantasy series called "The Lemurian Chronicles". First I came up with a high level outline and general story idea. Next, I began the arduous, but fun, task of world-building. I drew maps, created nations, cities and governments, and I began making lists of name ideas. Having all this work done in advance makes writing scenes very easy because the characters are so well developed, there is really only one way they could react in a given circumstance. And that is what I put down on paper. It also makes it easy for me to remain consistent with their personality throughout the story. As he lay contemplating, he heard a clicking sound, like a door latch, then soft footsteps walking across the main room floor. Quietly, Renn got out of bed, slipped his breeches and boots on, then cautiously cracked open his door and peered out. Artio was putting on his winter cloak as he stood by the back door. The old man picked up his staff, which was leaning by the door, and quietly slipped out. Too curious to ignore the Meskhoni’s midnight venture, Renn pulled on his over garment and quickly followed after. The mage was crossing the little stream as Renn gently let the door close. He waited until the old man disappeared into the trees, and then went in after, keeping a safe distance between himself and the mage. Artio walked for about ten minutes around boulders and trees, and then stopped abruptly in front of a high, rocky bluff. Renn quickly hid behind a large pine as the Meskhoni turned to look around, apparently making sure he was alone. A sudden burst of soft green light illuminated the area, and, when Renn peeked around the tree again, Artio was gone. Curious, Renn thought to himself. It’s as if he just disappeared into thin air. As he approached the cliff, he could see imprints on the soft earth from the Meskhoni’s feet, however, they didn’t lead anywhere. Renn had seen the man change from an eagle more than once, and wondered if that’s what happened. So, he looked up in the sky to see if he could see signs of the Meskhoni flying in the shape of some kind of bird, but he saw nothing. Immediately to the left of the jagged bluff, there was a dense grove of aspens, and, as Renn stood gazing into the sky, he heard a faint rustling sound from within the copse of trees. “Artio,” He whispered, “is that you?” There was no reply other than the soft humming of the cool breeze as it blew across the coin shaped leaves. He strained to see into the dark thicket, and took a step closer. “Hello? Artio, is that you?” He asked, growing slightly nervous. Renn breathed a sigh of relief and walked toward the sound of the Meskhoni’s familiar voice. “I was getting worried for a moment,” he said. As he approached the elderly man, he was bending over. Apparently, he was studying something on the ground underneath a particularly large tree, near a small clearing. “What is it?” Renn asked stopping behind him and looking over his shoulder. The old mage wore a strange grin as he slowly looked up. It wasn’t Artio! Renn gasped. He wanted to run, but was temporarily immobilized by his sudden fear. Whatever it was it didn’t even look human! Its deformed face was pale green and its solid eyes were blood red. Where there should have been a nose, there were three large holes set in a triangular shape. The creature’s cavernous mouth was pulled back into a wicked grin revealing two rows of razor sharp teeth with dark saliva dripping thickly out of its corners. “Glad you could join us, Chosen One.” It rasped in its true voice.